A 4 year old standardbred mare presented with a history of weight loss and recent quidding. Quidding is dropping of partially chewed hay balls from the mouth. This mare had dentistry performed approximately 2 months earlier where several severe dental problems were identified and corrected. She is owned by a veterinarian and receives excellent medical care. Hay and grain were present at the time of the exam, and the mare was observed to be quidding. The physical exam was unremarkable. We placed the mare in the stocks, sedated her and rinsed her mouth free of all food material before applying the dental speculum. Using a light source to enhance examination, the mouth and teeth appeared normal with evidence of the recent corrective dentistry. On individual palpation number 3-9, or the lower left 4th tooth, was found to be movable by digital pressure. There was no odor associated with this tooth. The tooth was loose enough to be deemed unsavable. The mare was further sedated and given analgesics. Spreaders were used to loosen the tooth from molars on either side of the subject molar. A larger sized spreader was then used to further loosen the tooth. Molar forceps were attached and the tooth was further loosened by manual manipulation of the forceps. Once it was determined that the tooth was sufficiently loose, a dental fulcrum was used to manipulate the tooth from its socket. 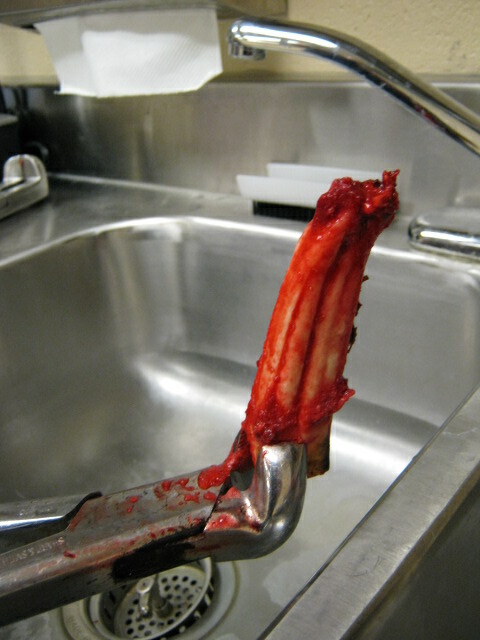 The entire tooth was removed and inspected to ensure it was complete. The mouth was rinsed the horse remained in the stocks until stable. The patient was discharged on antibiotics and analgesics. Telephone interview with the owner 2 weeks later revealed that the horse was eating and the quidding was nearly eliminated. The mare was reportedly gaining weight. The importance of continued dentistry was discussed. Horses may develop abscessed teeth from kicks, injuries, cavities, and chewing hard objects. These teeth may cause a lot of pain and stop or slow eating. Almost all abscessed teeth can be removed intraorally with the proper tools and techniques. In the past, holes were cut into the skull and the teeth were driven out with punches. This technique left permanent scars and disfigurement, so this practice is rarely used now. Once a tooth has been removed, the opposing tooth will need to be floated or shortened regularly to keep it from becoming too long. To chew properly, the jaws must be able to slide over one another. The food is ground finer as it moves to the back of the mouth before being swallowed. The roots of teeth on young horses are very long and get shorter as the horse ages. Horses in their twenties generally have much shorter roots allowing easier extraction. Horses that have regular good dental maintenance may survive into old age without ever losing a tooth. Horses that have had all of their molars extracted have been known to live 10 years or longer on special diets. 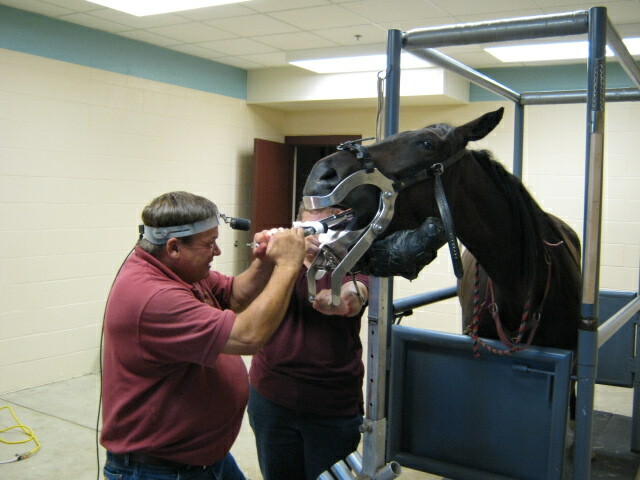 You can learn more about horse's teeth in our article on equine dentistry.